Military camouflage could blend into any number of different environments; a rescue worker's uniform could display bright attention-grabbing patterns during a search for victims of a natural disaster. Materials scientist Aaron Fishman and his colleagues at the University of Bristol have developed a design that uses electrical signals to mimic real squid skin. This fast-acting flexibility is routine for most squid and octopuses, thanks to tiny color-changing organs called chromatophores. With thousands of chromatophores on each square inch of skin, these animals have a tremendous canvas at their disposal. 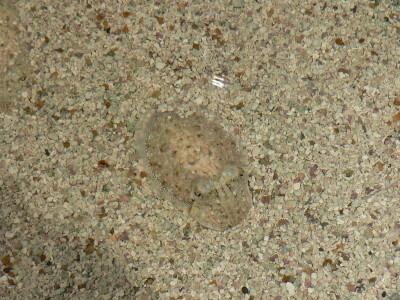 Camouflage is its most famous use; octopuses frequently frustrate aquarium visitors and underwater photographers with sudden disappearance. But octopuses, squid and cuttlefish—which all belong to a group called the cephalopods—can play many different tricks with their chromatophores. “Cephalopods use their chromatophores for a wide range of functions," says Hannah Rosen, a graduate student at Stanford University's Hopkins Marine Station who studies the color changes of Humboldt squid. Cephalopods can also use color changes to communicate with each other, and even to confuse their prey. One distinctive display called the “passing cloud” creates an illusion of movement, mesmerizing a crab or fish long enough for it to be trapped in the cephalopod's tentacles. Although humans don’t need to mesmerize crabs very often, the flexibility offered by cephalopod chromatophores could undoubtedly serve our purposes. 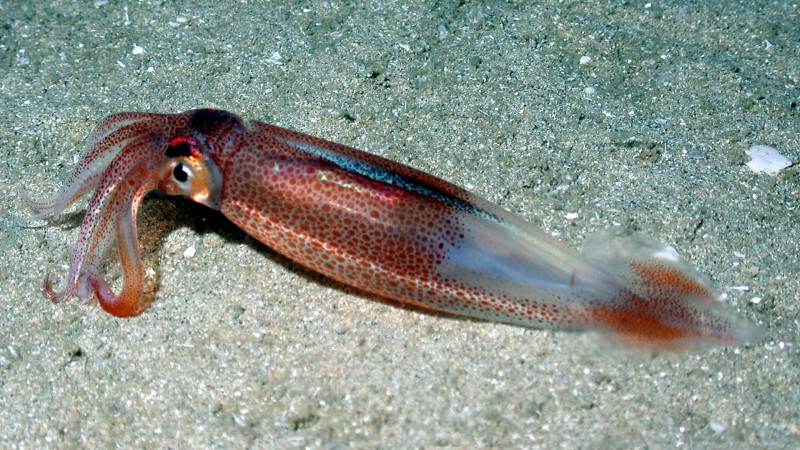 In fact, researchers have been working for years on squid-inspired camouflage. Real chromatophores consist of an elastic sac of pigment surrounded by muscles and nerves which eventually connect all the way back to the animal’s brain. When the nerves fire an electrical signal, the muscles contract and the pigment sac expands, turning “on.” When the muscles relax, the sac scrunches back to a nearly invisible dot. In a previous study, some of Fishman's colleagues created three prototype chromatophores, using a special “electroactive polymer” to mimic the expansion and contraction of a pigment sac. An electrical circuit builds up opposing charges on each side of the polymer, causing the two sides to attract each other. 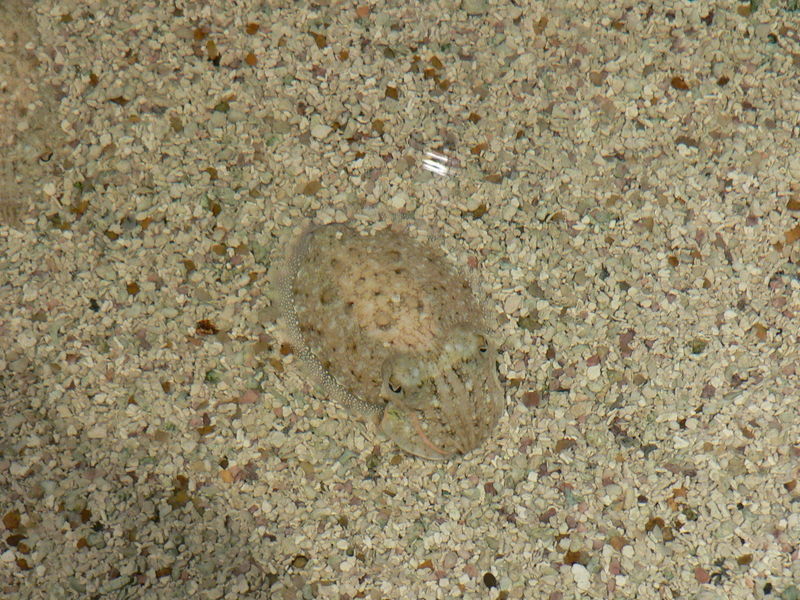 As they move closer together, they squish the artificial chromatophore flat. The polymer spreads out, turning “on” in a manner very similar to a real chromatophore. When the circuit is disconnected, the polymer reverts to its scrunched-up “off” state. Fishman and his colleagues built a computer simulation to find out what a larger array of such artificial chromatophores would be capable of. They found that the model chromatophores could produce complex patterns like those of a living squid or cuttlefish—including the passing cloud display. No central brain was necessary. But this is the exact opposite of how real cephalopods are believed to create their patterns. So: no brain, no patterns. However, she also points out that scientists are still grappling with the many mysteries of the chromatophore system, and there may be an as-yet-undiscovered, decentralized mechanism of control—like Fishman's set of simple rules. “I believe it is extremely plausible,” she says.